This post describes my experiences with upgrading from Win7 to Win81 and using it for a few days. I hope this will help others to avoid some problems and make them aware of (silently) missing functionality in Win81. I posted this information for discussion in the Windows 8.1 IT Pro forum too. Trying to do a backup in Win7 before the upgrade resulted in error “not enough disk space to create shadow copy.” This was caused be a test install of Win81 Preview as dual-boot which made a change to the common hidden System Reserved partition which did break Win7 Backup. I fixed this using fsutil usn deletejournal /N /D F: as suggested here. To keep my Win7 settings and desktop applications I did first upgrade to Win8 because MS removed keeping these with the Win81 upgrade. The first upgrade rolled back with errors. Digging through the hidden error log C:\$Windows.~BT\Sources\Rollback\setupact.err revealed some drivers belonging to VMWare and DAEMON Tools causing problems. After uninstalling VMWare and DAEMON the upgrades worked fine. I remember some sort of compatibility check with previous test installs of Win8 and do not know if they were not executed during this upgrade or do not detect VMware and DAEMON generally. Win 8.1 does (in contrast to Win7 and Win8) not(!) include a solution for a complete file based backup. Image backup is still available, but difficult to find: A Link on the bottom left of “Control Panel\All Control Panel Items\File History”, or you can use wbAdmin on a command line. Windows 7 Files Backup was removed in Win 8.1. Win81 File history does (in contrast to Win8) not backup SkyDrive, it does still backup SkyDrive Pro though. Remember: syncing to the cloud is no replacement for a backup. File History silently(!) skips EFS encrypted files. The event log shows the following “funny” error “…If you want it to be protected, remove encryption …”. Silently skipping the most important files is totally unacceptable, there should at least be a warning in action center. With these limitations of File History sadly we are forced to use 3rd party backup solutions. As feared my first try, using Acronis True Image 2014, was ugly. TI does not officially support Win81 yet (one of the problems why I prefer using built-in tools for basic tasks like backup). While TI worked fine with EFS and SkyDrive a reboot did hang for a night with the message “…operations pending…”. This is a known Acronis problem maybe not even related to Win81. Because the machine at this stage of shutdown did not allow me to remote login to kill the Acronis processes I was forced to do a hard reset – yuck. SkyDrive and SkyDrive Pro do not support EFS encrypted files. The explanations for this are questionable at least. Why can’t SkyDrive just do a binary copy when syncing (like robocopy \efsraw does)? And yes, if one would not have the EFS certificate installed on each machine or even loose it the files would not be readable – security does not come for free. Remember: Private files should only be stored in the cloud when encrypted with a key controlled by the user only (transport encryption and encryption in the cloud is not sufficient). Not supporting EFS or offering an alternative solution forces us to trust yet another party like BoxCryptor. With SkyDrive being tightly integrated into Win81 and MS urging us to use it user controlled encryption is mandatory and no longer just nice to have. There are reports of people having their SkyDrive account locked by Microsoft because the content or even the file names only did violate Microsoft’s very wide code of conduct. This happened with files that were private only, not shared with others. The search charm is too slow, see post. With Win7 / Start Menu or Win81 / Classic Shell searches for applications are instantaneous. The reminder popups of the Mail app obscure the search box when searching right after logging in. Unlocking BitLocker drives with a right-click form File Explorer does not work. Error “Application not found”. The Fix it did not solve this for me. Editing the registry manually worked. 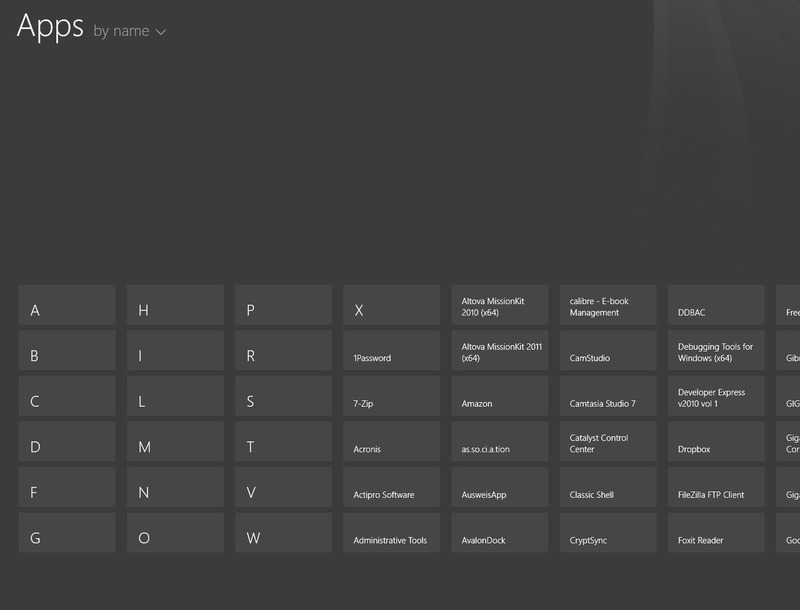 The All Apps view of the Start Menu is unusable for me. My Officejet Pro 8500 no longer supports scanning. No fix from HP available. NUMLOCK is always disabled after startup. Switching off “fast startup” as suggested in the forums is not a viable solution. The registry change suggestions I found do not solve this problem. The desktop task bar was annoyingly transparent. The only way I was able to change this was via Classic Shell settings. I hope this change persists if I decide to uninstall Classic Shell. After playing with the new navigation setting “Show my desktop background on Start” the desktop icon labels showed with drop shadows which looks very ugly with solid color backgrounds. Had to edit the registry to get rid of this. Removing the drop shadows only works with”Show my desktop background on Start” disabled. The problem still surfaces from time to time and logging off and on again fixes it. Some Windows updates (KB2887595, KB2837642) did hang causing countless reboots and forcing me to hard reset the machine. I never managed to install the cumulative update KB2887595. Windows Update leaks disk space. After using Win 8.1 for some days my system SSD was full. 40+ GB free space had disappeared. This was solved by the Windows update rollbacks caused by the update hangs mentioned above. Hyper-V seems to leak memory. Even after shutting down all VMs and applications Win 8.1 still uses nearly all of my 8GB RAM. Only a reboot frees it. As a Windows Phone developer one is forced to migrate to Win8 because the phone emulator requires Hyper-V.
Hyper-V (needlessly?) requires the special hardware visualization feature SLAT, forcing me the abandon otherwise perfectly good notebooks. VMWare does not install on a machine with Hyper-V enabled. This forces me to move from VMWare to Hyper-V on all machines sharing VM Images. Hyper-V is cumbersome to use: It is overly complicated to copy or move VMs. Without clicking on settings one cannot see where the files reside. The UI does not have end-user quality. Setting to share USB and other host devices difficult to discover, sometimes simply not reachable. Copying passwords, credit card infos etc. from my password manager 1Password to Modern Apps is cumbersome. Quicker delete, especially when bypassing recycle bin using <Shift>. Copying EFS files to remote folders is much quicker than in Win 7. More robust external drive handling. Win 8.1 still does not allow to eject USB sticks sporadically. Less problems with “file already exists” when copying large amounts of files. This entry was posted in Computers and Internet and tagged Security, Windows_8. Bookmark the permalink. Thanks for this post – it helps me to feel that I am not alone in having the problems with 8.1. that you report, and includes a solution or two! Hello Peter, have you had any issues with May windows updates, most of them require a system restore, as it wont boot fully, goes to repair mode.. I had no problems with the recent updates, but I was never able to install update KB2887595 in Oct 2013 and did hide it.